The Lamar University campus is located in Beaumont, Texas. With a population of more than 115,000, Beaumont is a diversified city, home not only to the university but also to businesses and industries stemming from a strong petrochemical and agricultural base. World-renowned companies are located in Beaumont to take advantage of the area’s resources and its educated workforce. A host of cultural attractions provide a variety of leisure options from museums and symphony presentations to spring and fall festivals. A civic center, convention center, entertainment complex, and coliseum draw professional entertainers and a wide variety of business, social, and professional groups to the city. Beaumont is convenient to water recreation, located conveniently between the Gulf of Mexico and the Big Thicket National Preserve, large lakes, and the piney woods. The campus is home to the Mary and John Gray Library, the Montagne Center coliseum, the Sheila Umphrey Recreational Sports Center, Spindletop-Gladys City Boomtown, multiple residence halls, and state-of-the-art facilities. Lamar University welcomes visitors, and information regarding tours may be obtained from the Office of Admission Services, P.O. Box 10009, Beaumont, Texas, 77710, or by calling (409) 880-8316. Lamar University originated on March 8, 1923, when the South Park School District in Beaumont authorized its superintendent to proceed with plans to open “a Junior College of the first class.” On September 17, 1923, South Park Junior College opened its doors with 125 students and a faculty of fourteen. Located on the third floor of the South Park High School building, the college shared the library and athletic facilities with the high school. In 1932, separate facilities were provided and the name of the institution became Lamar College in honor of Mirabeau B. Lamar, second president of the Republic of Texas and the “Father of Education” in Texas. On June 8, 1942, as a result of a public campaign, a new campus was purchased and classes were held for the first time on the present-day campus in Beaumont. After World War II, the enrollment grew to 1,079, and the Honorable Jack Brooks introduced a bill in the Texas House of Representatives to make Lamar a state-supported senior college. The Legislature approved House Bill 52 on June 4, 1949, creating Lamar State College of Technology effective September 1, 1951. Lamar was the first junior college in Texas to become a four-year, state-supported college. Lamar continued to grow, building strong programs in engineering, sciences, business, education, and the arts. In 1962, a graduate school was established offering master’s degrees in several fields. The first doctoral degree, Doctor of Engineering, was established in 1971. Since that time, additional doctoral programs have been established: Doctor of Education in Deaf Studies/Deaf Education (1993), Doctor of Audiology (2003), Doctor of Education in Educational Leadership (2004), and Doctor of Philosophy in Chemical Engineering (2005). In 1969, an extension center was opened in Orange, Texas. Two years later, House Bill 590 became law, changing the institution’s status from college to university. Lamar State College of Technology, with an enrollment of 10,874, officially became Lamar University on August 23, 1971. In 1975, the long-standing, private two-year Port Arthur College became Lamar University at Port Arthur. The Lamar University System, of which Lamar University – Beaumont was the flagship, was established in the 68th Session of the Texas Legislature with the passage of SB 620, which took effect in August 1983. In 1990, the Texas Higher Education Coordinating Board recommended that all two-year programs at Lamar University be combined into the Lamar University Institute of Technology. Programs in the former College of Technical Arts—along with Allied Health, Office Technology, and Restaurant/Institutional Food Management—moved to the new Institute. Lamar’s commitment to quality higher education has been steady and progressive, anticipating the evolving needs of its students. To facilitate this commitment, the Texas Legislature approved House Bill 2313 to merge the Lamar University System with The Texas State University System (TSUS) effective September 1, 1995. On June 19, 1999, the Texas Legislature approved House Bill 1297 to rename Lamar University at Port Arthur, Lamar University at Orange, and the Lamar University Institute of Technology. Today, these separate TSUS institutions are known as Lamar State College at Port Arthur, Lamar State College at Orange, and Lamar Institute of Technology. As a comprehensive university granting bachelor’s, master’s and doctoral degrees, Lamar University continues to enhance its instructional, service, and research missions. Lamar’s growth has produced an economic impact that exceeds $200 million annually and, even more influential, is the impact of more than 71,000 Lamar University graduates. A board of nine regents, appointed by the Governor and approved by the State Senate for terms of six years, governs The Texas State University System. The Board of Regents delegates the direction of university affairs to the university presidents, campus administrative officers, and faculty. Current members of the TSUS Board of Regents are listed on the TSUS website at http://www.tsus.edu. Lamar University is organized into six colleges. The Colleges of Arts and Sciences, Business, Education and Human Development, Engineering, and Fine Arts and Communication are each headed by a dean. Within each college are academic departments and programs, with each department being headed by a department chair. The College of Graduates Studies provides support services to enhance graduate education by recruiting, admitting, and enrolling qualified students and assuring degree requirements are met. The Wayne Reaud Honors College is attentive to the goals and aspirations of Lamar’s high ability students, engaging these students both within and outside the University to facilitate achievement of their goals. Lamar University engages and empowers students with the skills and knowledge to thrive in their personal lives and chosen fields of endeavor. As a doctoral granting institution, Lamar University is internationally recognized for its high quality academics, innovative curriculum, diverse student population, accessibility, and leading edge scholarly activities dedicated to transforming the communities of Southeast Texas and beyond. Lamar University engages and empowers students by providing access to a wide variety of educational resources. Students enjoy state-of-the-art advising and counseling services, first year experiences, study abroad opportunities, retention and completion programs, and service engagement. The leadership roles, research opportunities, work-related internships and part-time employment options available make practical experience a fundamental part of a Lamar University education. Our commitment to students involves providing them with broad practical skills (e.g., problem solving, critical thinking, teamwork, oral and written communication) that allow Lamar University students and alumni to have an immediate impact in the workplace. Our decades-long reputation for work-readiness is consistently reinforced among the employers who hire Lamar University graduates. Lamar University students thrive in their personal lives and chosen fields because we empower them with the advanced educational capacity to make choices and become leaders within their respective fields of endeavor and in the communities within which they live. Lamar University has a legacy of successfully matriculating first generation, economically disadvantaged and non-traditional college students and providing the educational opportunities they need to launch successful careers. Further, our alumni association provides networking opportunities for graduates as they explore options within their professions and in public service. Lamar University is a doctoral granting institution committed to creating a scholarly environment in which doctoral candidates collaborate with faculty scholars who are constantly enhancing the intellectual advancement of their respective fields. Our doctoral programs include Education, Engineering (both Doctor in Engineering and Ph.D. in Chemical Engineering), Deaf Studies and Deaf Education, and the Hearing Sciences, and our graduates contribute to their fields by advancing the leading edge of practice, science and discovery. Lamar University’s high quality academics include extensive degree offerings, both residential and online at the undergraduate and graduate levels. We take great pride in our reputation as one of the premier providers of engineers in the Southeast Texas region and beyond. Lamar University is one of the top producers in the United States of master’s degrees in engineering with an emphasis in Chemical Engineering. Our graduates in the arts and sciences, education, performing arts, and the professions contribute to the economic and cultural vitality of the region. Lamar University’s innovative curriculum leads the region in course content as well as through the variety of ways students learn. Whether residential or online, Lamar University offers timely, relevant programs. Beginning with our outreach to K-12 students, Lamar University is committed to exposing students to the opportunities in various fields of employment and academic endeavors. The Texas Academy of Leadership in the Humanities provides exceptionally gifted high school juniors and seniors access to challenging curricula that accelerate their academic advancement and promotes their intellectual curiosity. Once students enroll as undergraduates, they benefit from a nationally recognized core curriculum in which faculty strive to actively engage student learning through innovative pedagogy while a variety of advanced courses, many of them cross-disciplinary, prepare students for careers and graduate study in their chosen fields. Furthermore, Lamar University’s innovative offerings are enhanced through a tradition of faculty research dedicated to advancing pedagogy. Lamar University’s diverse student population makes us one of the most pluralistic public universities in the U.S., a distinction we cherish. We foster a campus culture and climate that celebrate diversity, and our faculty and staff avidly promote higher education opportunities for students from diverse backgrounds. Our university’s commitment to diversity begins early through our sponsorship of summer camps and other outreach initiatives exposing children from all backgrounds to opportunities in the STEM fields, athletics, music, and beyond. Lamar University is accessible. We deliver high quality educational experiences with demonstrated achievement in the preparation of individuals for successful entry into their chosen fields. Our faculty and staff are known for being approachable and proactively seek to remove barriers to access for students. For instance, financial aid and scholarship opportunities remove financial barriers and hardships. On campus, small classes facilitate interaction among students and faculty. Our university is also committed to offering a robust range of online undergraduate and graduate courses, degrees and certificates, that expand students’ access to higher education by providing them opportunities to be educated in place, at all times. Lamar University’s leading edge research and creative activity are hallmarks of our contribution to society. The university provides an environment that promotes and supports multifaceted research and creative activity, including important advances in the sciences and engineering that have contributed to the global community. Lamar University transforms the communities of Southeast Texas and beyond. In addition to its transformative role in the lives of students and alumni, Lamar University provides assistance to the region’s business community through its Small Business Development Center and the Center for Innovation, Commercialization and Entrepreneurship as well as participating in other initiatives in collaboration with both the for-profit and not-for-profit organizations. Lamar University’s faculty and students produce research that advances the protection of our environment and our understanding of factors contributing to air and water quality. Our fine and performing arts offerings enrich the community while Education programs prepare the next generation of teachers and school leaders for the State of Texas and beyond. In all that we do, the people of Lamar University strive to challenge the status quo and envision a brighter future for the those we serve, asking not only what can be, but how things ought to be. Diversity – We celebrate differences and ensure equal access and treatment for all. Quality – Continuous improvement is at the heart of our culture as we attract and retain a diverse group of promising students and immerse them in a demanding, exciting, and relevant educational environment. Innovation – Throughout students’ time at Lamar University and in their careers as alumni, we promote creative activity, social and commercial entrepreneurship, and substantive contributions to professional fields. Service – We recruit and retain high quality personnel for whom service is a commitment, and we bring this culture of service to our partnerships with stakeholders. Research and Creative Activity – Our theoretical and application-based research and creative activity are enhanced by the breadth of assets present in the Lamar University community, and which continually inform classroom activity across the university. Community – Our community is committed to unity and mutual support. Accessibility – Lamar University is accessible to people from all backgrounds, personal orientations, and physical abilities, including those who seek education in place through distance learning. Student-Focused – Our primary focus is our students, and we support their intellectual growth and maturation as well-rounded people steeped in high quality educational programs and expansive experiences. Integrity – Our community lives by a moral code based on honesty, professionalism and transparency. Data-Supported Decision Making – Lamar University integrates data into its deliberative processes, thereby ensuring that evidence informs judgments about our future. Lamar University is accredited by the Southern Association of Colleges and Schools Commission on Colleges to award degrees at the Associate, Baccalaureate, Master’s and Doctoral levels. For questions or information about the accreditation of Lamar University, contact the Commission on Colleges at 1866 Southern Lane, Decatur, Georgia, 30033-4097, or call (404) 679-4500. In addition, Lamar University is approved by the Texas Education Agency. The University is also a member of many academic councils, societies, and associations. In the College of Arts and Sciences, the undergraduate program in computer science is accredited by the Computing Commission of ABET, http://www.abet.org/. Other accreditations include nursing by the National League for Nursing Accrediting Commission and the program in social work by the Council on Social Work Education. In the College of Business, the undergraduate and graduate programs are accredited by the Association to Advance Collegiate Schools of Business (AACSB-International). In the College of Education and Human Development, the dietetics program is accredited by the American Dietetic Association. In addition, all teacher education programs of the university are approved by the Texas Education Agency and the State Board of Educator Certification and accredited by the National Council for Accreditation of Teacher Education (NCATE). In the College of Engineering, the undergraduate engineering programs in chemical, civil, electrical, industrial, and mechanical engineering are accredited by the Engineering Commission of ABET, http://www.abet.org/. In the College of Fine Arts and Communication, the Department of Music is accredited by the National Association of Schools of Music. Additional programs accredited include speech-language pathology by the American Speech-Language-Hearing Association and deaf education by the Council for Education of the Deaf. Persons wishing to review documentation regarding the institution’s accreditation, approval, or licensing may do so by contacting the Office of the Provost, Room 101 in the Plummer Building, (409) 880-8398. 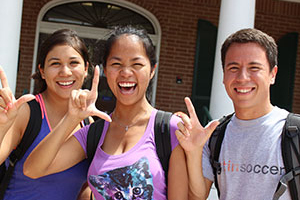 Students entering Lamar University’s general programs may enter at the beginning of any term. Application must be made well in advance of the date of entry. See Section 3 for information on undergraduate admissions and Section 4 for information on graduate admissions. Students entering the university’s accelerated schedule online programs (M.Ed., B.A.A.S., dual credit, and others) may enter more frequently. For information about entering dates for these programs, see the schedule. Lamar University delivers distance courses face-to-face on the campus and at West Brook High School and Lumberton High School. In addition, courses are delivered via interactive video to area high schools, and through LUOnline. Some online programs are delivered in accelerated terms of five and eight weeks. Most core curriculum courses are available online, and several degrees are available entirely online. For current information on all distance and online courses, degrees, and programs, go to http://luonline.lamar.edu/. Distance education students may contact the Division of Distance Learning by phone at (409) 880-7537 or by email at luap-questions@lamar.edu. Lamar University, along with all member schools in The Texas State University System, has become a smoke-free campus. According to TSUS officials, the system is committed to providing a safe, healthy, and pleasant environment for its faculty, staff, and students. Lamar’s policy applies to all faculty, staff, students, employees of contractors, and visitors to the campus and addresses the use of tobacco products, as well as smokeless tobacco, on university-owned or leased premises. Further regulations state the definition of tobacco products includes cigarettes, cigars, electronic cigarettes or similar devices, chewing tobacco, smokeless tobacco, and snuff. Tobacco use is defined as smoking, chewing, dipping, or any other ingesting, consumption, or bodily intake of tobacco products. The sale or free distribution of tobacco products or merchandise on campus is prohibited.